Over fall break, my family and I headed north to visit family in Minnesota. Given the length of the drive, we typically break it up into two days of travel, stopping along the way to explore various places we’ve never seen. Several weeks before we were to embark on this particular trip, I began researching what areas we could check out, and in my research, I stumbled upon the Great River Road. Dubbed “The Best Drive in America,” the Great River Road is exactly as it sounds — a road that travels along a great river, which, in this case, is the Mighty Mississippi. Similar in concept to the Natchez Trace Parkway, this National Scenic Byway runs from northern Minnesota to the Gulf of Mexico, tracking closely to the river’s edge and winding through countless quaint towns along the way. Its “scenic byway” designation means that those who travel this road are ensured a healthy dose of history, culture and natural beauty, and I can attest that we saw just that. According to the road’s website, it takes about 36 hours to drive from north to south on the byway, a journey that most people knock out in anywhere from four to 10 days. However, if you don’t want to do the whole thing at one time, you can easily jump on at any spot along the way, which is what we did. Once we figured out where we would get on, I downloaded the Great River Road app (available for Android and iOS), and we excitedly anticipated our journey. Here’s a glimpse into the majesty of this revered byway that travels through America’s Heartland. The Mississippi River leads curious travelers along the Great River Road. Leaving from Nashville, our options were to head to Memphis to get on the Great River Road, or we could shoot a little further north to jump on in St. Louis. Given that we had three kids in the car and we were looking to time things right with bathroom breaks, meal times and the anticipated cries of “how much longer?”, we headed for St. Louis, which is only a 4-and-a-half hour drive from Nashville. We burned off some steam at the City Museum, which is another article altogether, and then climbed back in the car, ready to start the real adventure. We got on the Great River Road in East St. Louis, and we headed north on Lewis & Clark Boulevard before shifting onto Berm Highway and quickly leaving the big city behind. With limited or no cellphone signal, the only real use for the iPhone was for taking pictures. Otherwise, there was plenty of beautiful scenery to entertain us along the way. We passed through the tiny rural towns of Hartford and Wood River before we came to Alton, a town located RIGHT beside the Mississippi River. Though it was only about 15 miles north of St. Louis, it felt like a million miles from anywhere. Alton is a true river town, located in the midst of where the Illinois, Mississippi and Missouri rivers intersect, and it has a strong industrial vibe. With a commercial district comprised of beautiful brick buildings, Alton is the hometown of jazz musician Miles Davis and was the site of the Lincoln-Douglas debate of 1858. The town is rich in history and is dotted with grain silos and historic homes. As it was once home to various brick factories, there are also a significant number of brick-lined streets there. After a few miles of nothing, you suddenly arrive in Alton, IL. The streets of Alton’s commercial district rise up from the river and are filled with beautiful brick buildings with vibrant businesses operating within. Back on the road heading out of Alton, we traveled for miles with this view — beautiful foliage and steep bluffs on the right, and endless views of the Mississippi River on the left. About 20 minutes past Alton, we arrived in Grafton, IL, which is a lively town. In fact, I’d love to return there for a weekend. Prior to the Great Flood of 1993, when the waters reached a record-setting 38.2 feet, the population of Grafton hovered around 1,000. Today, it’s just shy of 650 full-time residents as people left following the flood. More of a tourist town, Grafton has adorable boutiques and plenty of dining options from which to choose. We stopped in at Grafton Winery & Brewhaus, which was quite popular. We enjoyed some live music and a delicious lunch, and afterward, when the sun came out, we ventured out onto the rooftop patio to get a view of Grafton at its best before getting back on the road. Behind the Grafton Winery & Brewhaus was a colorful row of homes that overlook the river. Houses directly on the river serve as rental accommodations, boutiques and restaurants. People park along the street and opt to walk, taking time to explore the shops, absorb the views and perhaps grab a bite to eat. Our stopping point for the night was Burlington, IA. So after Grafton, we climbed back into the car and enjoyed the views for the next 3-and-a-half hours as daylight began to fade. After a solid night sleep at our Burlington accommodations, we woke to sunny skies and crisp temps, ready to check out this beautiful midwestern town. An industrial and manufacturing city, Burlington is filled with churches, historic buildings and quiet streets filled with beautiful homes. 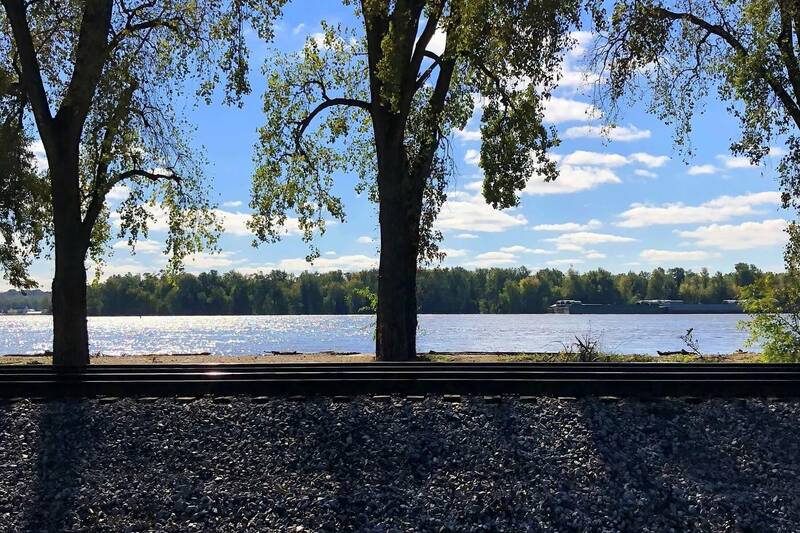 The Mississippi River feels slightly more discreet in Burlington than it did in other towns along the Great River Road, perhaps because of the size of the town, which is considerably larger than the smaller towns we had visited so far. While there are plenty of things to see and do in Burlington — gambling, hiking, museums — the one MUST is a ride down Snake Alley, which is akin to San Francisco’s Lombard Street. Dubbed the “Crookedest Street in the World,” Snake Alley is a steep, winding brick road with homes curiously placed along each slanted side. Snake Alley is also the site of the Snake Alley Criterium, a renowned uphill bike race that takes place there each Memorial Day. Beautiful brick streets, well-kept yards and marvelous historic homes all make Burlington, IA, a lovely place to explore. Snake Alley, aka “The Crookedest Street in the World,” is a must-see when in Burlington, IA. In the distance, you can see the waters of the Mississippi River quietly churning by. An hour north of Burlington is Muscatine, IA, an area steeped in Civil War history, having sent more men to battle than any other Iowan county despite its small population. Another interesting point about Muscatine is that it’s the only place on the Mississippi River where the water actually runs east-west instead of north-south. As we approached Muscatine, my husband Scott, who grew up in Minnesota and played in an ’80s hair band, recalled a time when the band (you may have heard of them — they were called Mystic. No? Okay, anyway … ) played in Muscatine. “It’s a steel town, a working man’s town. Alcoa was the biggest employer,” he said, setting the stage. “We played behind a chain link fence because everyone got so rowdy in that bar that the fence provided a barrier to the flying beer bottles,” he added, describing what sounded like a scene from Road House. Today, with the ’80s — and his hair — long gone, my husband found Muscatine to be a quieter place than he remembered. We marveled at the parks, hiking and historic neighborhoods and sites like the Pine Creek Grist Mill, where we stopped to stretch our legs. The old mill, which was once used to grind wheat and flour that was then shipped off down the Mississippi, welcomes guests who may want to cross the bridge and hike the trails. There’s also an old schoolhouse nearby, properly preserved and a site that feels very much like the “Little House on the Prairie” schoolhouse, but with one extra door. Reading up on these various spots invites your mind to wander to times long-ago and piques your curiosity about the hearty folks who lived there. The Pine Creek Grist Mill, located in Muscatine’s Wild Cat Den State Park, was built in the 1800s and was used to grind wheat and flour that was then shipped down the Mississippi. Cross the bridge and take a hike, or take a seat on a bench and marvel at the water running nearby. An old schoolhouse is right next to the mill, and beyond that is an outhouse presumably used for bathroom breaks. After Muscatine, we headed for Davenport, IA, our last stop before getting back on the interstate. Davenport is part of the Quad Cities, which also include Bettendorf, IA, and Moline, East Moline and Rock Island in Illinois. The third largest city in the state, Davenport has a population of 100,000 who reside among the hilly, tree-lined streets. In downtown Davenport, we were quick to notice the heavy emphasis on the arts — theater, music and visual — and the streets were bustling on the Monday afternoon when we were there. We cruised through downtown and then wandered the neighborhoods, where we saw some very large, unique homes. There’s a sense of revitalization going on in Davenport as well, as there was quite a bit of home construction taking place. Davenport’s City Hall is a sturdy fieldstone building that stands watch in the heart of downtown. Large historic homes like this one could be found at every turn. As we traveled the Great River Road, we passed through countless tiny towns, saw spectacular views, stopped to read historic markers and even stopped to greet a herd of cattle on a quiet intersection somewhere in Iowa. These are the moments you just don’t experience when you travel via interstate, which is exactly why the Great River Road was such an enjoyable adventure during our fall break. I will leave you with some parting shots that showcase just how beautiful this area of the country — the Heartland of America — truly is. Enjoy! The railroad often separated the Great River Road and the Mississippi River. We saw hopper cars that pulled directly into granaries to capture their load before heading down the tracks. You can see the river in the distance. On the road in Iowa, we had the Mississippi on one side, and on the other, corn fields, the bluffs and some beautiful homes that no doubt have unbeatable views of the river. On a desolate stretch of road in Iowa, we happened upon a herd of cattle, and in the bottom middle, you’ll see they had a little white bird who was visiting as well. The crops had been harvested and the fields turned over on land as far as the eye could see. Every so often, after miles of nothing, we would happen upon a farm surrounded by countless acres of farmland. On the left-hand side, you can see that this home is a “Century Farm,” a special designation when the home and farm has been operating within one family for more than 100 years. When you download the Great River Road app, the menu offers easy-to-navigate categories to help you find the places you want to stop and explore. For example, “Museums/Historic Sites” led us to this historic marker honoring Chief Taimah near Kingston, IA. To learn more about the Great River Road, visit experiencemississippiriver.com. Find more travel tips, weekend getaways, destination ideas and so much more in our “Travel” section. Click HERE.